If you wish to escape your hectic day for a moment, you should dine at Pauly Saal at the “Ehemalige Jüdische Mädchnschule” for a relaxing lunch. Upon entering the restaurant you will be welcomed by a maître d’ who takes your jacket, and from that moment you’re in very good hands. In terms of the interior, every detail is immaculate: tableware with the house logo, heavy crystal glasses and starched napkins. You’ll find two choices for starters, main dish and dessert plus a daily; all with friendlier lunch prices. A regional and seasonal approach to food is their motto and a focus on German fare with a touch of fusion cuisine. 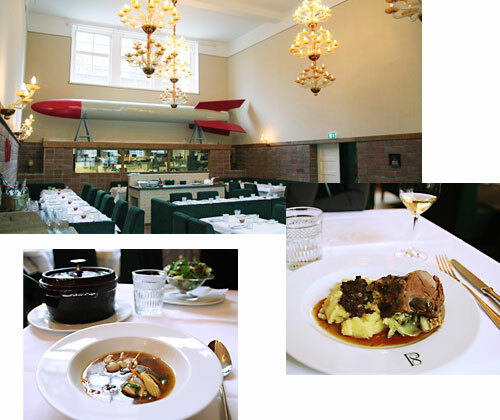 We savored the German fish soup as a starter, chicken frikassee with peas, mushrooms and polenta on the side and roast kid goat with mashed potato with blood pudding croutons. For desert we enjoyed lemon tarte with hazelnut ice cream and a “Herrengedeck”, a chocolate cake with ice cream and set sheep milk. Yummy! A restaurant with excellent service and food!